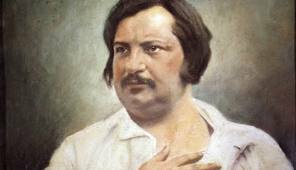 I’ve been meaning for a long time to read the 19th century French writer Honoré Balzac (1799-1850), just maybe the first really modern writer of novels in his realistic depiction of people, particularly as to what motivates them, with keen observations of places, trends, and social discourse. I’m actually embarrassed to say I haven’t tried him out before, as I earned my bread for some forty years teaching literature at the college level. While it’s true that my specialty was 19th century British literature, I often taught some of the great French masters like Voltaire, Flaubert, Proust, Camus and Gide. Balzac I somehow missed, maybe because my own profs had themselves passed him by, though considerable talents like Henry James, Flaubert, Zola and Proust modeled much of their work on his methods: long sentences weighted in details; psychological probing focused on characters, both major and minor, fraught with ambiguities amplified by an acutely observant omniscient narrator acquaintance. Hard to believe they could do this, when you ultimately discover he’s widely thought of as one of our preeminent writers of fiction. I came upon Balzac finally via The New York Review of Books, which recently published a collection of his short stories as part of its Classic Books series. It seemed a good place to start with this prolific writer who penned some 85 novels and novellas under the canopy of The Human Comedy in the short space of 20-years, the first modern writer to make a living by his pen. (Dickens got the message, obviously.) Some say Balzac worked himself to an early death, writing to pay off his many debts. Every human type is plainly exhibited in The Human Comedy, which in some ways, makes it analogous to Chaucer’s Canterbury Tales, with the frequent use of a frame device in which a narrator employs a particular circumstance–locale/event–as foreground for story telling. Unlike Chaucer, a narrator may himself serve as a frame device, setting up minor and highly divergent sub-narrators spinning their own versions of people and events. What’s more, you don’t have Chaucer’s naive narrator, who often, comically, misses the truth left for readers to discern. Balzac’s narrators are deeply serious about divulging the truth behind the vagaries of human guises. My first impressions of Balzac have been mixed. He’s certainly your acute observer of every palate of human experience, whether of fashion, politics, religion, historical figures and events, even–and surprisingly, coming so early–repressed libido urges within his characters. There is also a fluidity, or speed, to his sentences, however long they may be, which, unlike James, avoids a tangled syntax. Frequently, however, he digresses, leaving off finishing one story before indulging in another, followed by still others, as if imitating the desultory nature of most of our conversations. In a very real sense, Balzac is all about story telling, or the verbal interplay between people. He could probably have achieved success in drama, and actually did write several plays. At the moment, I find myself, however, drowning in detail, sprawling sentences sometimes running two pages held together by semicolons and, as I’ve hinted, numerous digressions to the point I lose track of whom and what. If Balzac is about rendering conversation, surely he misses the mark, for none of us dialogs this way, or the way of essay. But everything in Balzac, by the same token, has a way of taking on a life of its own, places as well as people, particularly Paris. You are there, on a street, in a room, an invisible witness to every nuance of quotidian humanity, encyclopedic, exhaustive in minutiae, often disturbing, but always revelatory. To get at Balzac better and reach a more informed impression I, of course, need to go on to some of his masterpieces like Eugenie Grandet, Père Goriot, and Lost Illusions. Otherwise, it’s like visiting France and omitting Paris. This entry was posted in Books, Reflections and tagged Balzac, Balzac short stories, French literature, French novels, The Human Comedy. Bookmark the permalink. Have yet to commence a Balzac journey, Eugénie Grandet sounds like a good place to start for me, because I already have an association with it through the work of Louise Bourgeois, she created a whole series of works having been haunted by the character of Eugénie Grandet which I read about in Muze, a wonderful French culture, arts and literary magazine. Thank you, Claire, for your reply., and for your interest in Balzac; also, for mentioning Bourgeois and Muze. I’d be interested on your take re: EG, if you get a chance. I shall definitely add it to my list now that it has come to my attention again.